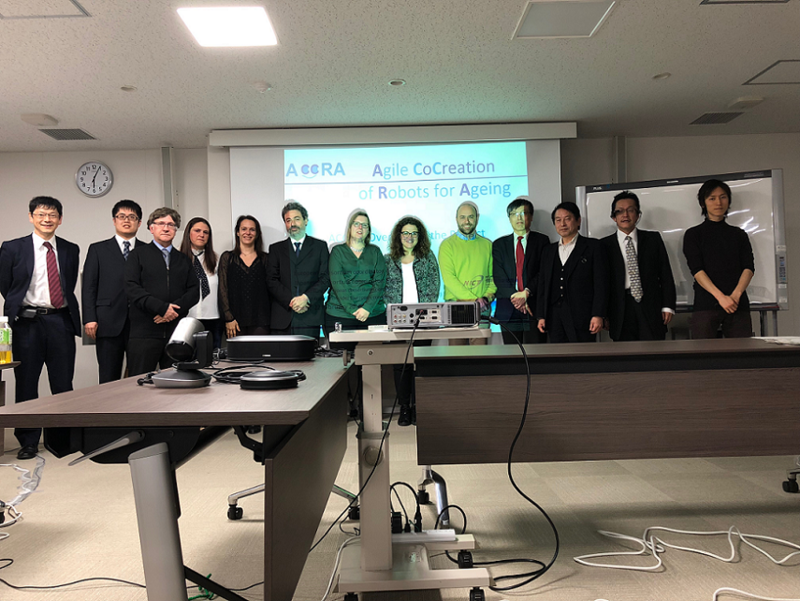 TRIALOG conducted together with his ACCRA project partners the first review / audit of the project which took place in Kyoto, Japan on 22 February 2018. The first year of the project was dedicated to the transition from the study of needs to the technical functionalities for robotic applications, using the agile co-creation methodology, which is clearly necessary today for/in the creation of innovation. The co-creation methodology is not so simple as it could seem; It is necessary to gather a heterogeneous, multidisciplinary group, covering all the stakeholders involved in the use of the product to be built. Trialog also proposes an agile engineering approach based on the co-creation in order to reach and shape, step by step, the final product. It was highlighted during the review that one of the particularities of the project is the collaboration of the Europe / Japan teams. In particular the management, co-creation, and reporting methods are different and the evaluators expressed a need for convergence between the two approaches; the sharing of management cultures as well as technologies is one of the main goals of the project. The evaluators were very satisfied/pleased with the number of users involved during the study and co-creation phases, more than 150 in total. This result was obtained thanks to the involvement of “pilot” partners in 4 different countries (CCAS Antibes (F), WVO Zorg (NL), Casa Sollievo della Sofferenza (I), Fukujuen (Japan) and under the impulsion/push of the methodology defined by the partner Université Paris Dauphine. An important point was remarked, the need of “Giteki” certification for the introduction of robotic technologies using radio frequencies (Wifi, Bluetooth, etc) from Europe to Japan. Finally, it was a great opportunity for the European team to discover the culinary culture of Kyoto.